The charity running the Edinburgh international science festival is to ban sponsorship from oil companies including Shell and Total after protests by climate campaigners. Edinburgh Science said on Wednesday it realised its commitment to educating people on climate change was substantially compromised by accepting money from fossil fuel companies. The charity said the oil industry “is not moving fast enough” to cut greenhouse gas emissions, adding that “climate change is without doubt an urgent threat of unprecedented magnitude”. Edinburgh Science has taken money from Total and Exxon to pay for its “Generation Science” tours of Scottish schools, promoting science as a career in classrooms, as well as from Shell and the Scottish Oil Club. Climate activists had warned Edinburgh Science it faced protests during this year’s festival, which starts this weekend. Protesters believe the festival does not do enough to educate visitors about the threats posed by climate change. The Scottish Oil Club was targeted by Extinction Rebellion activists last month when it held its annual dinner at the National Museum of Scotland, leading to 14 activists being charged. The Edinburgh international festival dropped BP as a sponsor in 2017. One science festival event for families this year involves teaching children how to find and drill for oil, inviting participants to construct a scale-model drilling rig. In contrast, this year’s Edinburgh medal for scientific achievement is being awarded as part of the festival to Christiana Figueres, the executive secretary of the UN framework convention on climate change. 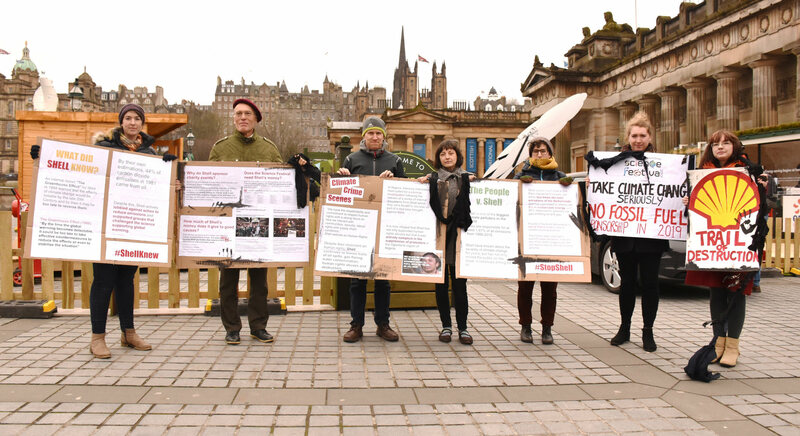 Edinburgh Science said: “With the issues of climate change ever present and urgent, we feel increasingly compromised by the conflict between accepting sponsorship from fossil fuel companies and programming events that scrutinise the main causes of climate change. “The UN intergovernmental panel on climate change (IPCC) calls for a dramatic and immediate reduction in the amount of fossil fuels consumed if we are to keep global warming to no more than 1.5C. Tara Wight, a spokeswoman for the campaign group Science Unstained, said the charity’s decision was welcome. “By being associated with science outreach events, fossil fuel companies aim to clean up their image and present themselves as responsible organisations that are in alignment with scientific consensus on climate change.